While exploring the ancient Khmer monuments at Angkor, I had many encounters with modern Cambodians. The temple complexes of Ta Prohm and Preah Khan sprawl over much of the earth, so you can meet many locals there. I found lots of dramatic contrasts between traumas from the Khmer Rouge days, and hopes for a brighter future. 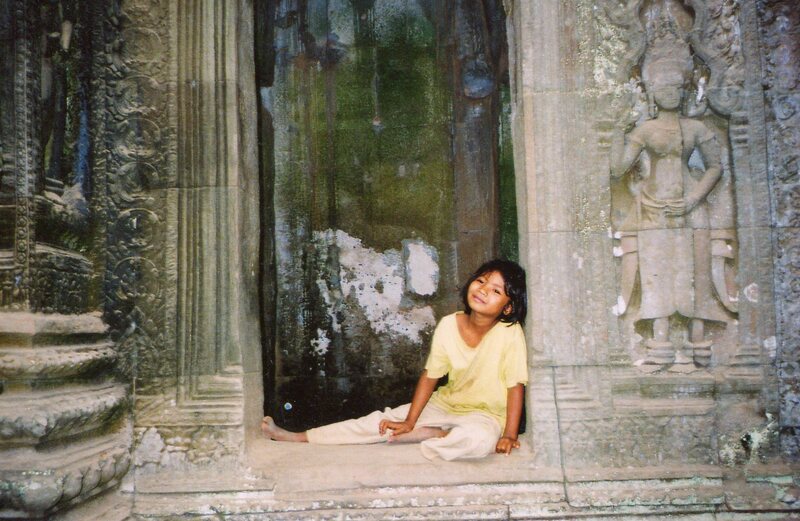 I had a lot of full days in Cambodia. I found the horror as soon as I entered both temples. A traditional Khmer orchestra of 7 or 8 men sat on a straw mat and played xylophones and gongs. All were missing at least one limb, and many had lost two. The Khmer Rouge planted perhaps millions of landmines in northwestern Cambodia, and they’ve ripped arms and legs off of thousands of unsuspecting locals (the area around Angkor is considered high risk–stay on beaten paths). At least these men had music, a group of other musicians, and people to play for. But all their faces were sullen. They found a little niche to retreat to that could give them a some security in a world that had been very harsh with them. Their little worlds contrasted with the Angkor’s grand monuments. But many children were playing in Ta Prohm’s courtyards. The joy and bright yellow shirt of the girl in the photo burst through the grey buildings, so I couldn’t resist asking if I could photograph her. She seemed completely carefree–no American kid has had a playhouse like this. Many times in Camdodia, I saw lingering traumas from the recent past, and lots of energetic young people who are quick to be friendly and have fun. Since returning home, I’ve met other Americans who fell in love with the place and long to go back. You can live a full life there in a few days. As grand as the Khmer monuments are, they’re only the surface of what you can see. But since this blog as about cultural wealth, you can also explore Ta Prohm and Preah Khan here.